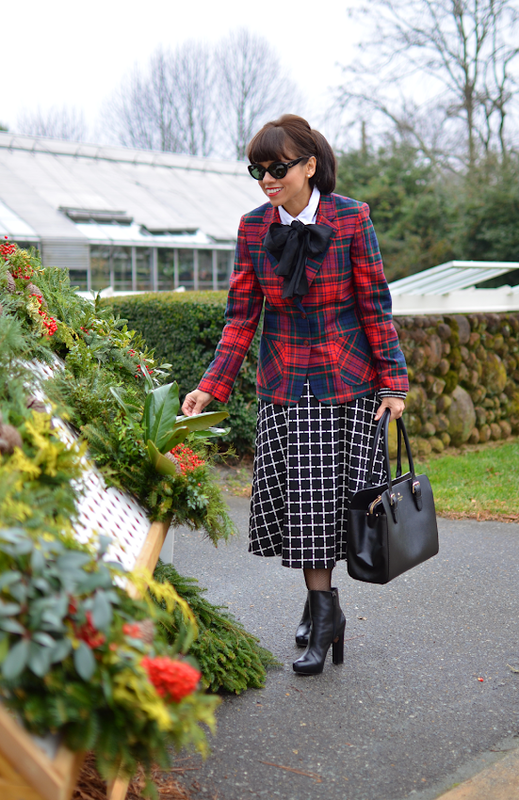 And I matched the mood of town by wearing my versatile tartan jacket, with its colors just perfect for the holidays. I love mixing patterns as many of you already know, so mixing plaids is one of the combinations that I really enjoy. Bringing this window pane patterned skirt to the game was an easy decision to make. The silk vintage scarf pretty much brought all of the pieces together. Ya esta comenzando a verse como la Navidad…y yo seguí el ambiente de la ciudad llevando mi chaqueta roja tartán, la cual tiene colores perfectos para esta temporada del año. Ademas de combinar otra clase de estampados, también me gusta combinar los cuadriculados como lo hice con esta combinación de hoy. Mi pañuelo de seda fue el toque que entrelazó todos los atuendos de este conjunto y que también le añadió mas diversión. Blazer/Chaqueta: Hunter (vintage). Check this cardigan version. Muchas gracias preciosa! Pero nada como tu estilazo. Wow love your outfit! Perfect for the holidays :) you really have impacable taste in fashion! Thanks so much Nicole for your comment! and I am also following you as well. Thanks sweet candy! I enjoyed reading your blog and your traveling pictures. You are a lucky girl!! You are so stylish Dear! Right back at you! Thanks Loonia! What a gorgeous smile you have dear! Isn't great? I love its versatility. Un look ideal para capturar el espíritu navideño, y también tu original y vanguardista estilo! Gracias guapa!! Mira que me hicisteis reír con esa camiseta en tu blog. Tu eres chistosa. In a word, Pretty! But wait, I'm not known for one word comments! Classic, but current, playful with an edge! Love it Carelia! nicee! shall we follow by fb and bloglovin? Thanks Christina! Btw, I really like your plaid skirt and you styled it beautifully!! Thanks!! and I really love your tartan dress and the way you styled it. I'm so glad plaid is back, since is such a versatile print. Gracias bella por tu comentario! Ya visité tu blog y estas de maravilla. Te estoy siguiendo en bloglovin. Besos. Thank you!! Your colorful look got all my attention in bloglovin feed. I love how you put all those jewel colors together and made them look so chic. You have nailed clashing print like a BOSS. Absolutely amazing! Thanks so much Edyta! I enjoyed reading your last post about furs and seeing your glamorous pictures. Loving that prepster blazer on you! Thanks Laura! I just visited your blog and I have decided to do better wrapping presents this year. I am so bad about it. That blazer is so much fun! Thanks so much!! I love your mixing in your last post. Plaid is one of my favorites this fall/winter - love how you mixed the prints. I can tell!! I love your suggestions in one of your posts. Thanks for visiting. Great style, really love it! Somos fans de las gafas y las tuyas nos encantan! Me alegra Romina!! Estas gafas son tan chulas y me salieron durables. LOLL…I was so lucky to find it at my local vintage shop last year. Hello,Ciao...so stylish...so great outfit...is a work of Art and you're an Artist of Style!